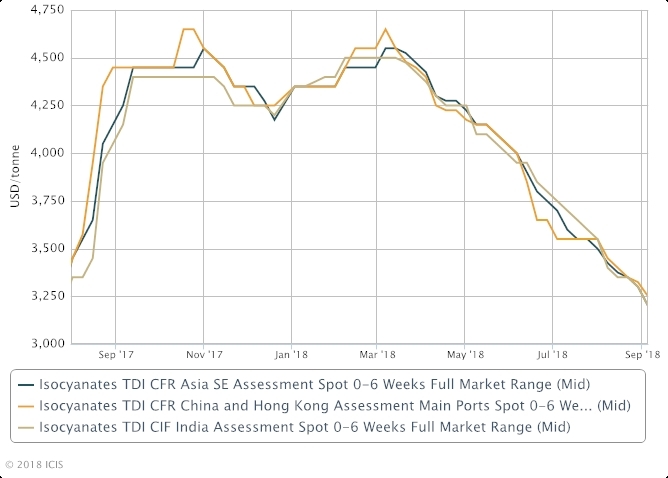 SINGAPORE (ICIS)--The slide in Asian import prices of toluene di-isocyanate (TDI), which begun more than five months ago, may continue further if downstream off-take fails to pick up soon enough, market participants said. This week, northeast Asia-origin TDI cargoes available to ship in the month had traded at levels $50-100/tonne lower week on week. According to ICIS data, cargoes headed for China and Hong Kong fetched on 5 September, an average of $3,250/tonne on a CFR (cost and freight) basis, which is 30% lower than the $4,650/tonne CFR China/HK peak seen in March. Import prices into southeast Asia and India have dimmed similarly. On 5 September, TDI discussions were at $3,150-3,250/tonne CFR southeast Asia and India, down from well over $4,000/tonne in March, ICIS data showed. Prices probably “have not seen bottom yet”, a trader said, unless demand improves markedly and quickly enough. Usually, demand for TDI trends up in the second half of the year, as production in key downstream applications, such as furniture and bedding manufacturing, typically ramps up in summer to prepare for anticipated consumption boom in the year-end festive season. But this year, the pattern seems to have shifted, industry sources said. Downstream off-take of TDI has been significantly slower this year, compared to the same time in past years, a TDI maker said. Factors such as stricter government controls on industrial activities for environmental protection purposes, as well as jitters from ongoing US-China trade wars, are key behind the suppressed TDI demand in China, regional traders said. Many downstream factories in China are not running at full rate, and may not have plans to ramp up soon, as they are increasingly apprehensive that the trade disputes and environment control measures would be longer-drawn than expected. Understandably, their buying appetite for raw materials like TDI has grown smaller correspondingly. “(TDI) Orders have slowed to a trickle,” a regional trader said. Unless downstream demand picks up, prospects of a near-term reversal in the current downtrend of TDI prices “may be remote”, a northeast Asian TDI maker lamented. In recent times, sellers have been continually pricing TDI lower, and lower again, in a bid to stimulate buying. But some are hopeful that prices may see some floor soon if the supply picture shifts. South Korea’s Hanwha Chemicals has plans to shut its 150,000 tonne/year TDI facility in Yeosu for a month-long maintenance from mid-October. Another 50,000 tonne/year facility in India may also undergo some maintenance later this month too, market sources said. These ensuing cut in spot availability may help support prices to some extent, a regional trader said.